Two HTML5 games in Two hours. 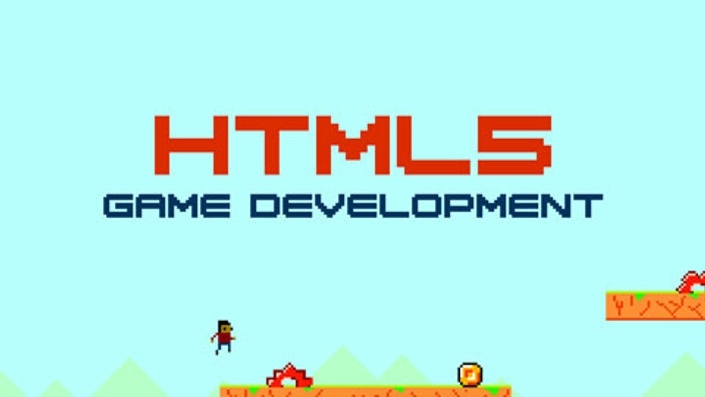 HTML5 Game Development will teach you all that you need to know to get started with creating your first game in HTML5 so you can start building captivating games from scratch. This course is packed with step-by-step instructions to help you build modular code, optimize your game for deployment, and easily modify and reuse game logic to extend your game. With this course, you'll build two incrementally complex 2D games that run on both desktop and mobile browsers. This course will explain game programming best practices, complete with simplified game logic, physics and collision handling, as well as custom graphics and fonts. Your first exercise is a simple counting game that lays the foundations for creating clean, customizable, and modular code. We'll then move on to building a “rush” game with moving backgrounds, basic physics, and dynamic scoreboards. We'll cover essentials such as handling mobile touch events, controlling scene transitions, custom fonts and graphics, optimizing your game's load time, a loading progress bar, collision detection, keeping score, and creating a deployable game. HTML5 Game Development will be your guide as you create two complete games that are compatible with multiple desktop and mobile web browsers. Makzan is the founder of 42games limited (http://42games.net). He began building apps and games on the Web when he was a child. He built iOS games that have ranked No.1 on the App Store as well as demos on the Apple store. He now focuses on teaching programming. Makzan has also written two books named Flash Multiplayer Virtual World and HTML5 Games Development Beginner's Guide. I would like to thank the whole team from Packt Publishing. The video series will not be possible without the help from all the editors. I thank all reviewers for providing very useful comments from which I have learnt a lot. I thank my family for giving me support during the process.